Rachel Levange is dreading the upcoming holidays, as it will mark the first season without her parents. Then, on top of all that, she gets involved in a car accident and breaks her leg. Can her life get any worse? Well, yeah. She’s a recent law school grad, jerking lattes at Starbucks. But then she meets Mike McCafferty, a handsome lawyer who has his own secret sorrows. He’s about to become a federal judge and he offers Rachel a clerkship. 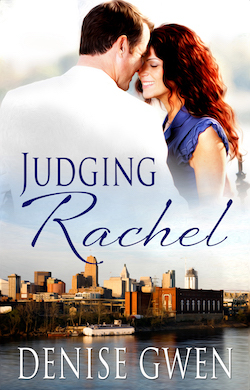 As Rachel and Mike get to know one another, and learn of each other’s secret pasts, they discover how important it is not to judge. But will it be enough to sustain their love?